In Improv 3 students begin to learn to connect their scenes into a cohesive piece. Students are pushed to tap in to the “group mind” and work together toward a mutual focus using devices like walk-ons, tap-outs, and other scenework mechanics. In addition to the group work students also receive personalized feedback and challenges that are specifically tailored to their individual needs. This class will meet weekly for 8 weeks at the Fallout Theater (616 Lavaca St) on Wednesdays from 6:30-8:30pm starting Wednesday March, 20th. Students will also perform in a Sunday night class recital show at the end of the course. Rob has taught and performed improv across the U.S. and internationally for over ten years, and has engaged in theatre/mischief-making for way longer. 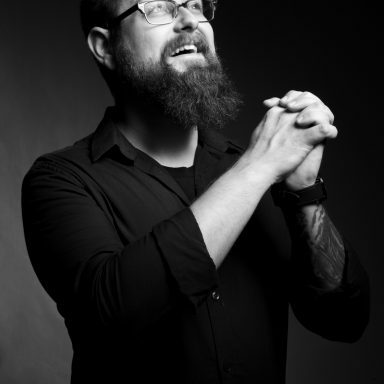 He holds an MFA in Theatre Directing from Baylor University, is a B. Iden Payne Award nominated director, actor, and fight choreographer, and loves teaching improv grounded in relationship building, unabashed play, and giving one’s scene partners a great time. He is kind of a human porg, and has more beard than face.